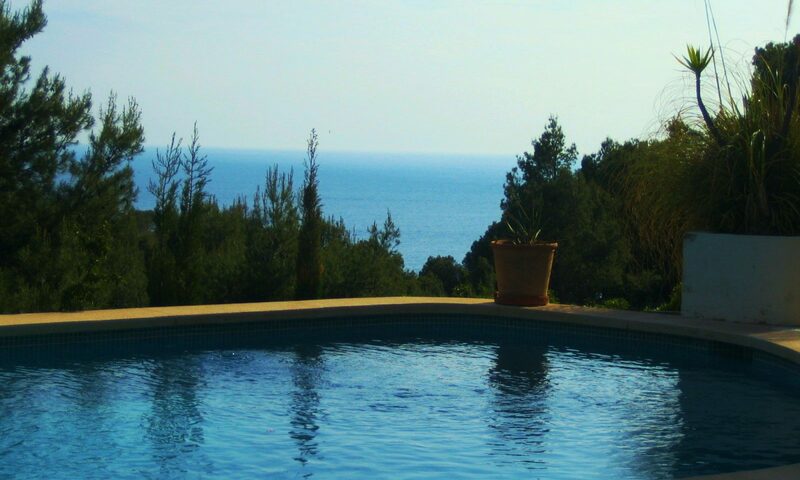 This luxurious Moorish-style estate is located in a cultivated villa community on Mallorca’s south-west and sunniest coast, “Costa de la Calma”. Our holiday apartments in Santa Ponsa are surrounded by a beautiful garden, full of tropical plants. It’s a 3 minute walk from your patio to the beach. Enjoy the sea, sunbathe on the beach or rocks, or watch a stunning sunset. If you feel like a change of scenery, in Costa de la Calma or the neighbouring towns of Santa Ponsa or Paguera, you’ll find cosy restaurants and cafés, boutiques and grocery stores, as well as nightlife to suit every taste. The elegant capitol, Palma – with its picturesque cafés, restaurants and historical old town – is only 10 minutes away by car or bus. Casa del Sol is located in a quiet, elevated area in a little bay – about 150 meters away from the beach. Each apartment offers all the basic home comforts and is fully equipped with towels, tableware and bedding. The property is located on a slight slope, with mature trees that allow you to choose between sunny and shadier spots. Our apartments are surrounded by a beautiful garden, full of tropical plants. Between the palms is a goldfish pond with a small fountain. Every apartment is equipped with sun lounges, lawn chairs and tables. The building is centrally heated. Of course you can use the outdoor-pool, which you only hae to share with the three other parties in the building. The holiday apartments in Santa Ponsa lies at the coast of Calivia. This is the wealthiest tourist area not just in Mallorca, but in all of Spain. It’s 13 kilometres from Andratx to the junction of the multi-lane motorway to Santa Ponca and Costa de la Calma. From here you can quickly reach Peguera, one of Mallorca’s most lively towns which is very popular with tourists. The traffic-calmed main road is bordered by restaurants, bars, hotels and shops. Small, narrow alleys lead to the sandy beach. On the west side of the bay is the sophisticated, sloping resort of “Cala Fornells”, built in the style of a Moorish fishing village. The bay with its long sandy beach is an attraction in its own right with ideal conditions for surfing and water-skiing. Southwest of Santa Ponca is the smaller bay of Sa Caleta. Relatively quiet, it offers a pleasant beach that is hardly ever used by tourists – a real insider tip. Apartment 5 is equipped with two air conditioning units. The use is charged with 0.20 cents / kwh .